These Candy Crush Jelly Level 52 cheats and tips will help you beat Jelly Level 52 of Candy Crush. The objective of Candy Crush Jelly Level 52 is to use 15 moves spread the jelly across 40 tiles. In candy crush jelly level 52, you will find that the jelly is tucked away between licorice locks and the pies. This makes it hard to start spreading if at all it is not accessible and especially at the bottom half. The priority then should be unlocking the jelly so that you can start spreading it all across the 40 tiles in 15 moves. There different ways that you can start especially in breaking the licorice locks. 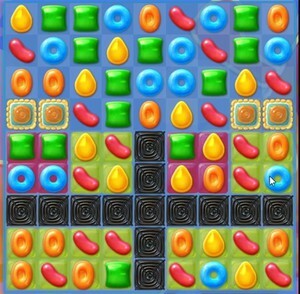 At the initial stages, you can start with matching candies adjacent to these blockers but whenever you have a chance to use special candies, use them. Use of special candies is more advocated from the fact that it can clear the blockers in just a few moves. Once the jelly has been release, then completing candy crush jelly level 52 becomes very easy.